The LifeNuts program is based on the work of scientists who studied cultures around the world that had relatively high percentages of centenarians – people over 100. Books such as Healthy at 100 and The Blue Zones documented lifestyle characteristics in these cultures. The book, Living to 100, used research obtained in the ongoing New England Centenarian Study. However, most of these cultures, located in remote rural areas, had a much different stress level: no traffic jams, no 60-hour work weeks, no home foreclosures, low divorce rates, and no media blaring bad news daily. Yes, their stress is different. Accordingly, stress management plays a critical role in increasing longevity. Some folks have a knack for handling stress while others respond by binging on food or alcohol or engaging in other negative behaviors. As a nation, we don’t seem to be handling it well. Our health and longevity indicate we have problems that diet, exercise, and community involvement don’t fix completely. The USA has the highest per capita health care spending in the world. We have wonderful doctors, famous clinics and hospitals, effective drugs and world class medical technology. Yet we rank 36th in longevity. We live an average of 78.3 years (We lost .3 years in 2011). The Japanese, ranked first in longevity with an average lifespan of 82.6 years, live nearly four and a half years longer than Americans. 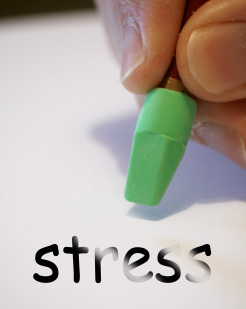 No, stress is not a dirty word, despite its popular connotation. Stress is defined as a non-specific response of the mind and the body to any change in the environment. That’s it. Stress, by itself, is neither good nor bad: it’s the response to change in one’s life. Charles Darwin, the famous naturalist, once said, “It is not the biggest, strongest, or fastest species that survive, but rather those most responsive to change.” How we deal with stress affects our health and our longevity. 1. The stress response of eustress. 2. The stress response of distress.